FL7M Series DC-2-wire Regular Cylindrical Proximity Sensors. 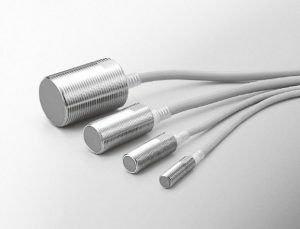 The FL7M series DC-2 wire regular cylindrical proximity sensors are an industry standard in positioning and welding applications. They have a highly waterproof rigid structure with an improved visibility indicator lamp with a firefly glow that can be seen from any direction. Features include low current consumption (0.55 mA), sealed to IP67G, and super quick response time (2 kHz).